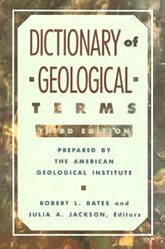 Click a letter below to find the definition of a geological term. A fan-shaped wedge of sediment that typically accumulates on land where a stream emerges from a steep canyon onto a flat area. In map view it has the shape of an open fan. Alluvial fans typically form in arid or semiarid climates. Shown in the photo is the Badwater Alluvial Fan of Death Valley. A conspicuous hill with steep sides and a flat top. The top is usually a cap-rock of resistant material. This structure is frequently an erosional remnant in an area of flat-lying sedimentary rocks. The photo shows the south face of Fajada Butte, Chaco Culture National Historical Park. A hollow cylindrical drill bit used for cutting a cylinder of rock, called a "core," from a well. The bottom of the bit is made of metal with embedded diamond abrasives for grinding through rocks. As the bit cuts down through the rock, the "core" is contained within the last section of drill pipe. About every thirty feet, all of the drill pipe and the drill bit are pulled from the well so the core can be lifted to the surface and removed. Coring is very slow and very expensive work. Earth Science is the study of the Earth and its neighbors in space. It includes the study of solar system astronomy, geology, oceanography and meteorology. Some people assume that "geology" and "earth science" are identical, but that is not true. "Geology" is a much more limited science and just one part of "earth science." Colored flashes of light emitted from a gemstone that result from incident light being separated into its component colors as it passes through the stone. Each gem material has a characteristic dispersion. Some have exceptional dispersion and produce a very intese fire. Although many people believe that diamond has the strongest dispersion of all gems, a few gems such as sphalerite, demantoid garnet (shown in the photo), sphene, and zircon have an even greater dispersion. Garnet is the name of a group of silicate minerals that share a common crystal structure, but they vary in composition. Most garnets are red in color, but the mineral also occurs in orange, yellow, purple, green, pink, black, and other colors. Shown in the photo from top to bottom are: spessartine, almandine, mali, rhodolite and tsavorite. In addition to being used as a gem, garnet is used as an abrasive, filter medium, sand-blasting granule and waterjet cutting granule. There is no universally agreed upon definition for the word "gemstone." The word usually triggers an image of attractive mineral materials that have been fashioned into gems to be worn for personal adornment. Some people believe that gemstones should also be durable, rare, valuable and skillfully cut - but some items formally called "gemstones" lack all of these. Many gemstones are rocks, organic materials, mineraloids or even objects from space that lack durability, rarity, intrinsic value and are used in their natural state. As an example consider a small pearl used in an inexpensive necklace sold at Walmart. Hundreds of materials have been used as gemstones, see photos of over 100 here. An area of increased dip in otherwise gently dipping strata. The image shows a monocline over a reverse fault. A fault with vertical movement and an inclined fault plane. The block above the fault has moved down relative to the block below the fault. The dip angle of the fault plane is between 45 and 90 degrees. Normal faults are the typical structural style of divergent plate boundaries and portions of the crust under extensional stress such as the East Africa Rift. A Hawaiian term for a lava flow that has a surface flow structure that looks like coiled rope or cord. Lavas with a relatively low viscosity can form a "ropy" surface. The term is also used for the rock materials after the flow has cooled. Small creatures that have adapted to a permanent life in a cave. They are so well adapted to life in a cave that they would be unable to survive in the surface environment. To survive in the darkness, troglobites have highly-developed senses of hearing, touch and smell. Many troglobites have lost their sight and their pigments. A crystal that does not have uniform color or composition. This can be caused by a change in the composition or temperature of the fluid from which the crystal was growing; twinning; or, variations in exposure to heat or radiation. Minerals such as olivine or plagioclase which have a solid solution series are frequently zoned. Shown in the image are two faceted tourmalines cut from zoned crystals produced by growth. The one on the right is known as "watermelon" for obvious reasons. Also, consider ametrine, a bicolor quartz that is a combination of AMEthyst and ciTRINE believed to be caused by twinning.